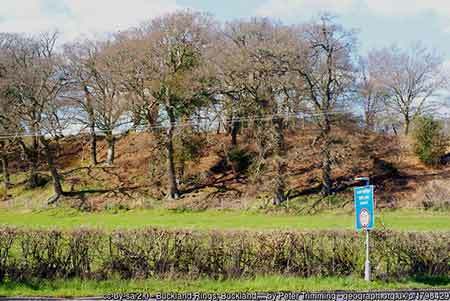 Buckland Rings, an important Iron Age hill fort dating back 2,000 years, and more, is located a little to the north-west of Lymington town centre, beside the often busy A337 Lymington-Brockenhurst-Lyndhurst road. Few passing travellers, however, are likely to realise that this imposing monument from pre-Christian times is so close by, for the remains of the fort are largely shrouded in well-grown trees, many themselves centuries old. But people who take the time to stop and walk around the fort will inevitably feel a sense of awe in the presence of earthen structures that pre-date the arrival of the Romans, that go back to the days when tribal kingdoms held sway in Britain before even England as a unified nation existed. The ridge-top, almost rectangular site of this fortified enclosure stands a modest 27 metres (90 feet) above sea level and covers an area of around 2.8 hectares (almost 7 acres). It is considered to be the New Forest’s most impressive hill fort - Forest resident and antiquarian Heywood Sumner in 1923 referred to it as ‘the finest earthwork in the Forest district’ - and it is certainly the only well-preserved multivallate hill fort - multivallate: a fort with more than one set of ditches and ramparts. Indeed, small multivallate hill forts, such as Buckland Rings, are apparently rare with only around 100 examples recorded nationally, and as this is the best preserved and most important in the Hampshire / Dorset basin, it is considered to be of national importance. The enclosing series of ditches and ramparts – the ramparts were usually built up using material excavated from the ditches – would have provided a somewhat formidable barrier to encroachment by aggressors, particularly as the inner rampart was probably topped by a wooden fence, creating within a safe, defended place for people to live. It has, though, been convincingly suggested that ditches and ramparts were often constructed as much as status symbols to impress the neighbours as for defensive purposes, but without documentary evidence, this is virtually impossible to determine for certain. The fort’s interior, although ploughed in the past and used to grow crops until as recently as the 1980s, is now open grassland, whilst the tree-clad ditches and ramparts are best seen along the southern, northern and north-eastern boundaries where triple ramparts and double ditches remain in an excellent state of preservation, inevitably somewhat silted and eroded, respectively, but still an impressive testament to the highly organised society responsible for their construction. Trees, however, would originally have been completely absent from the ramparts and the fort occupants would consequently have enjoyed fine views over the surrounding countryside, an essential feature providing the potential for early warning of the approach of enemy forces. Similarly, clear views from a distance away, of such a well-defended fort would surely have acted as a deterrent to attack. Richard Wainwright – A Guide to the Pre-historic Remains in Britain, 1978 – described these ditches and ramparts as ‘two banks with external V-shaped ditches and an outer counterscarp bank’, and suggested that the inner bank may have been 3.7 metres (12 feet) high with a 9-12 metre (30 – 40 feet) wide base, whilst the middle rampart was possibly 2.4 metres (8 feet) high and 9.1 metres (30 feet) wide at the base. 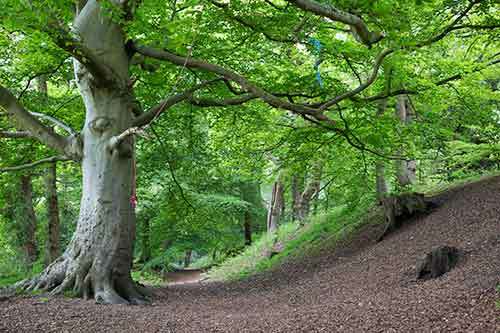 Today, according to Historic England, ‘the inner bank is the largest, rising steeply to a maximum of 6 metres (20 feet) above the base of the 10 metre (33 feet) wide ditch and up to 2.5 metres (8 feet) above the interior of the hill fort. The middle bank rises 2 – 3 metres (6½ - 10 feet) above the base of the inner ditch and is up to 10 metres wide at the north and east, with a broad, uneven top; elsewhere it is of similar height but less broad. The outer bank is also 2 – 3 metres high for much of its length but it is generally narrower and, along the southern side of the hill fort, intermittent’. The ditches and ramparts in the south-east section were ploughed out in the 18th century, whilst those in the west are on private land abutted by the minor road to Hordle and Sway, the construction of which appears to have destroyed the fort’s outer rampart. Current expert thinking suggests that small multivallate hill forts were settlements occupied on a permanent basis and that Buckland Rings, strategically positioned overlooking the Lymington River, was likely to have been an important farming and trading centre. Limited excavation, primarily around the entrance and adjacent ditches and ramparts, in 1935, under the supervision of Christopher Hawkes, indicated that the entrance, now ploughed out, was in-turned and that it had two large internal post holes, probably for a gate. Other discoveries included a hearth, several worked flints and part of a stone mace head of Neolithic date. But a 1993 geophysical survey conducted in the interior found little conclusive evidence to support the existence of a settlement, although geological conditions were apparently not conducive to this type of survey. 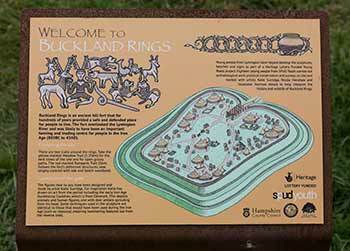 Despite the lack of extensive excavation and a consequent absence of substantial evidence, some experts have suggested that Buckland Rings may date from the 5th century BC and may have started out with a single bank and ditch. The ramparts may have been subsequently refurbished and the outer ramparts added, and the site may have fallen out use by the 1st century BC. It would seem, however, to be virtually impossible to precisely date the site. Notes: a) Buckland Rings was bought by Hampshire County Council in 1989 and is scheduled under the Ancient Monuments and Archaeological Areas Act 1979, as amended, b) Two houses were built within the western section of the fort in the early 20th century, and c) Information about Buckland Rings' history is displayed around the site.